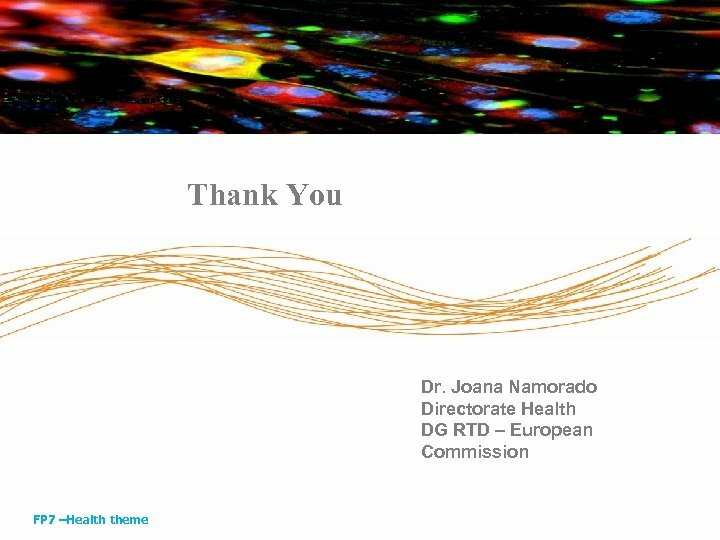 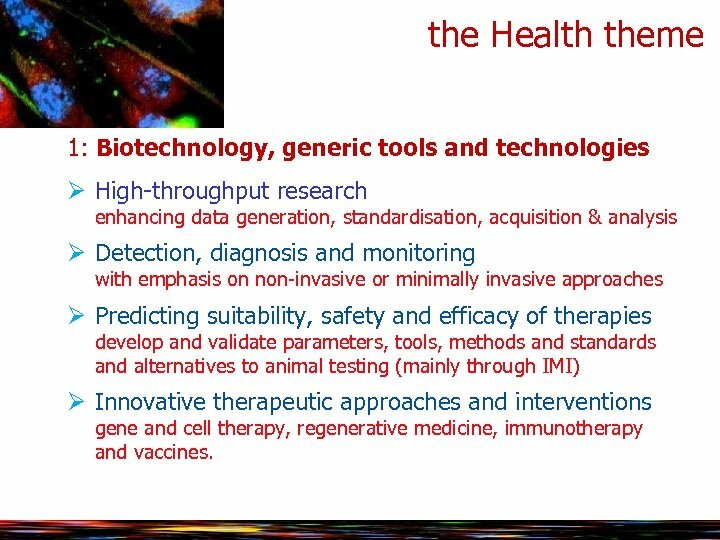 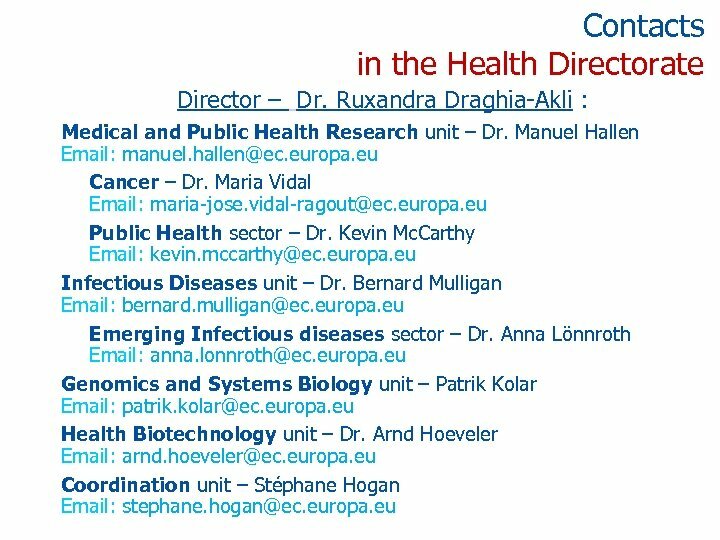 the Health theme 1: Biotechnology, generic tools and technologies Ø High-throughput research enhancing data generation, standardisation, acquisition & analysis Ø Detection, diagnosis and monitoring with emphasis on non-invasive or minimally invasive approaches Ø Predicting suitability, safety and efficacy of therapies develop and validate parameters, tools, methods and standards and alternatives to animal testing (mainly through IMI) Ø Innovative therapeutic approaches and interventions gene and cell therapy, regenerative medicine, immunotherapy and vaccines. 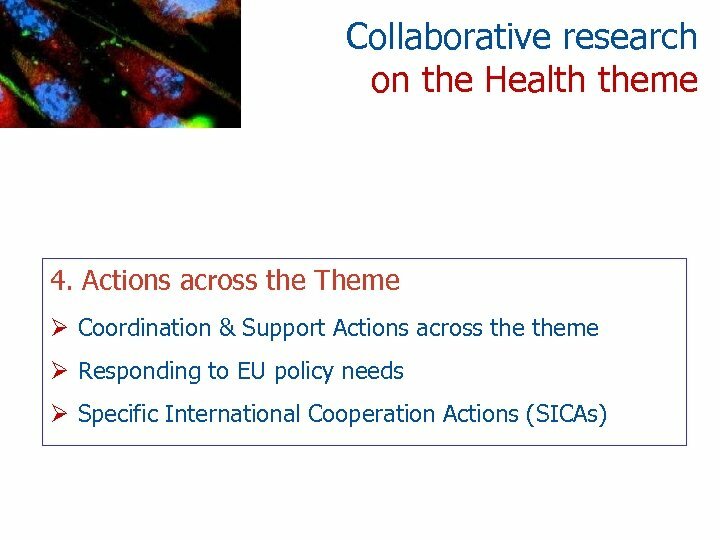 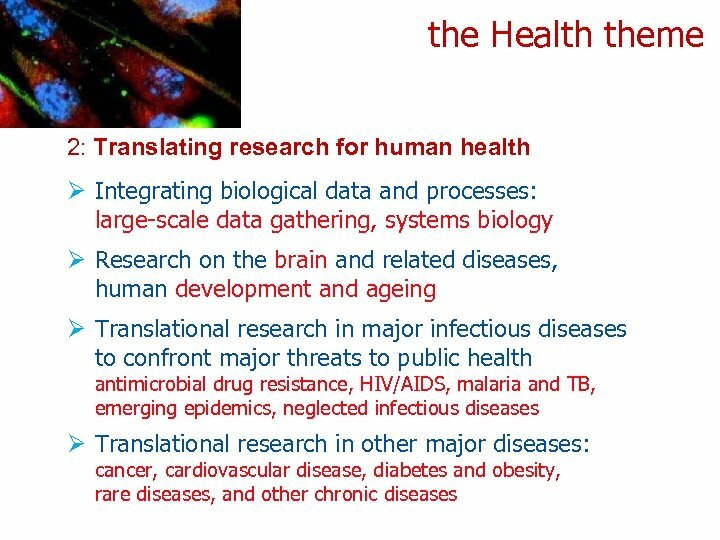 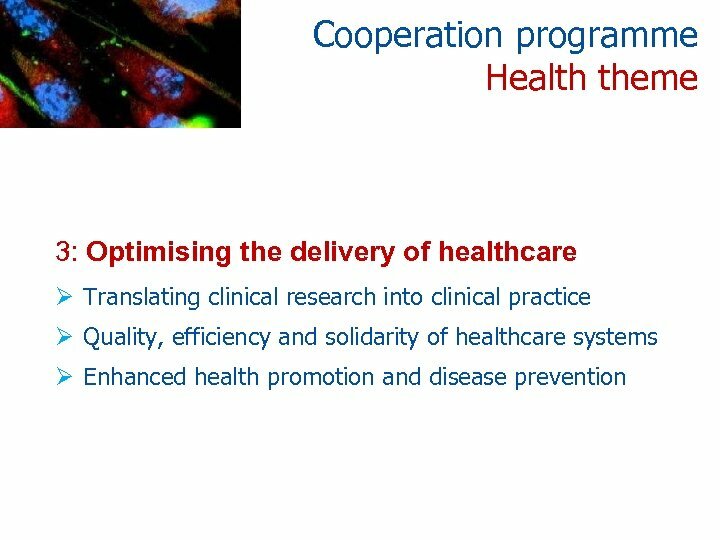 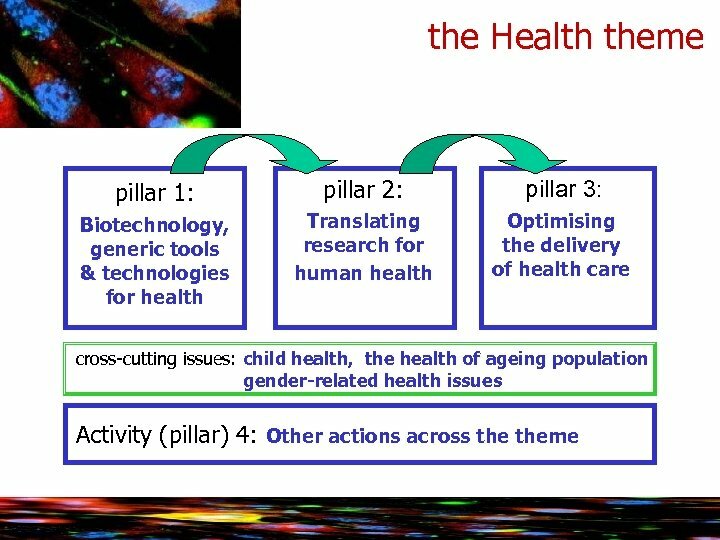 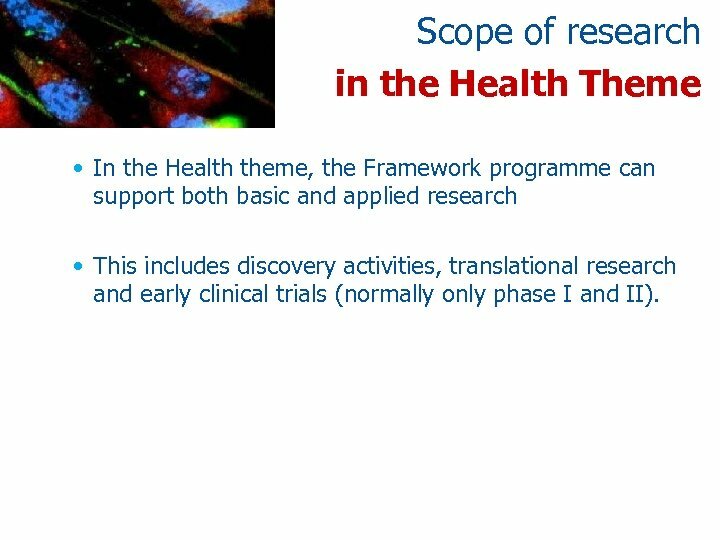 Scope of research in the Health Theme • In the Health theme, the Framework programme can support both basic and applied research • This includes discovery activities, translational research and early clinical trials (normally only phase I and II). 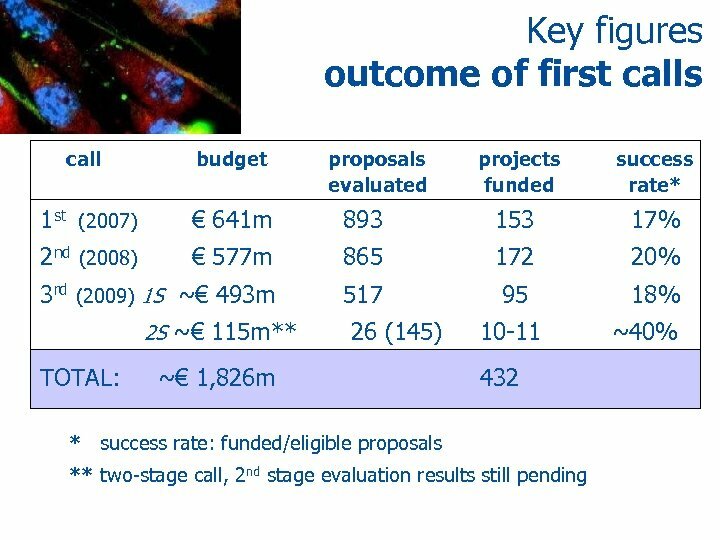 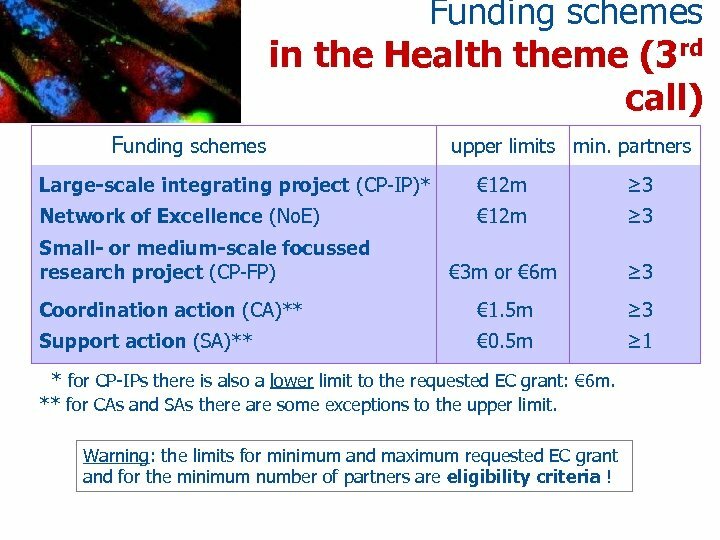 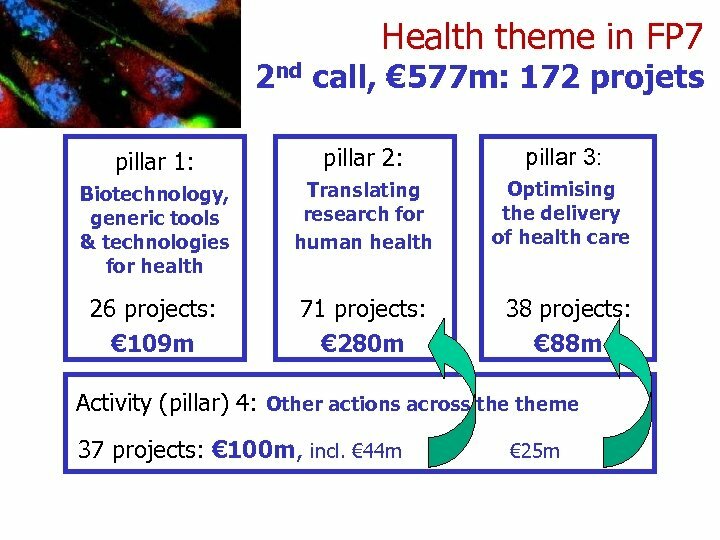 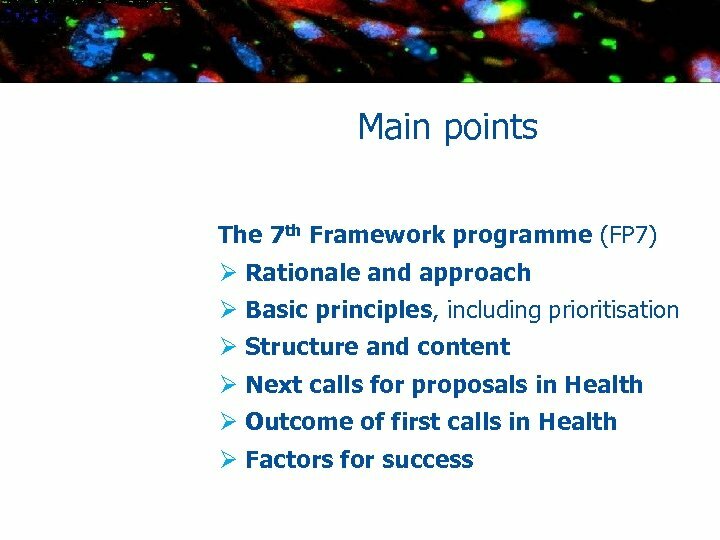 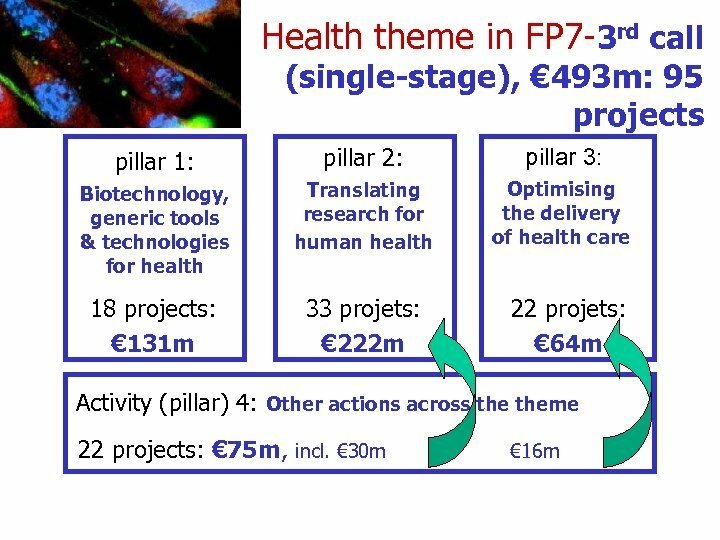 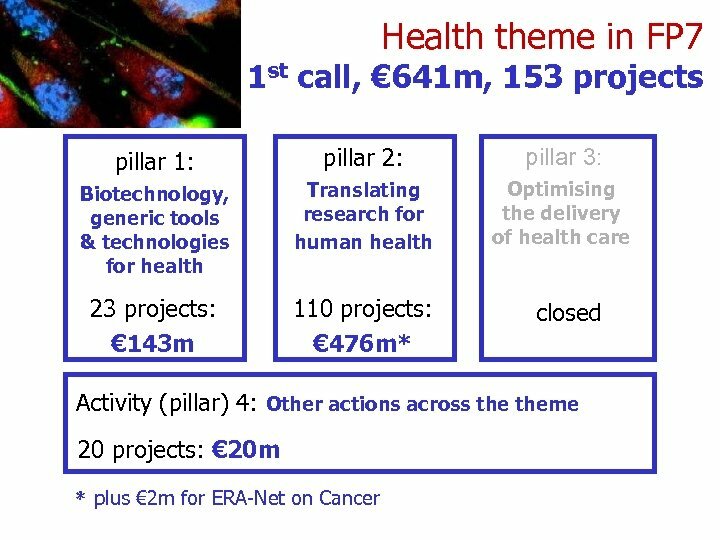 Funding schemes in the Health theme (3 rd call) Funding schemes upper limits min. 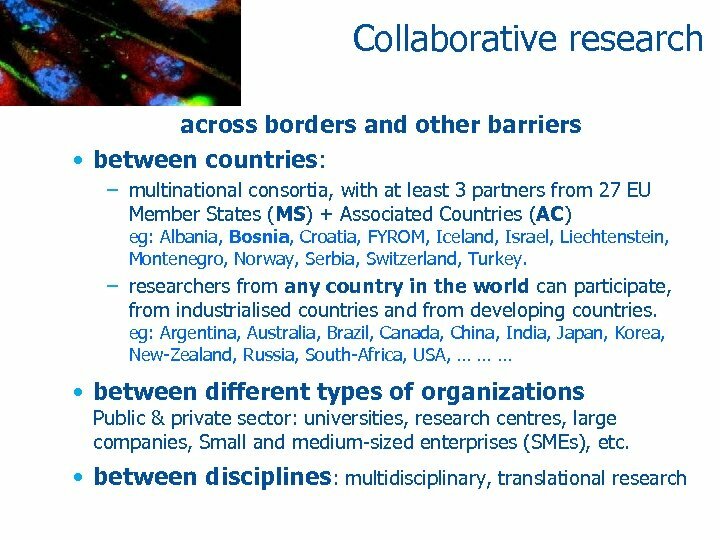 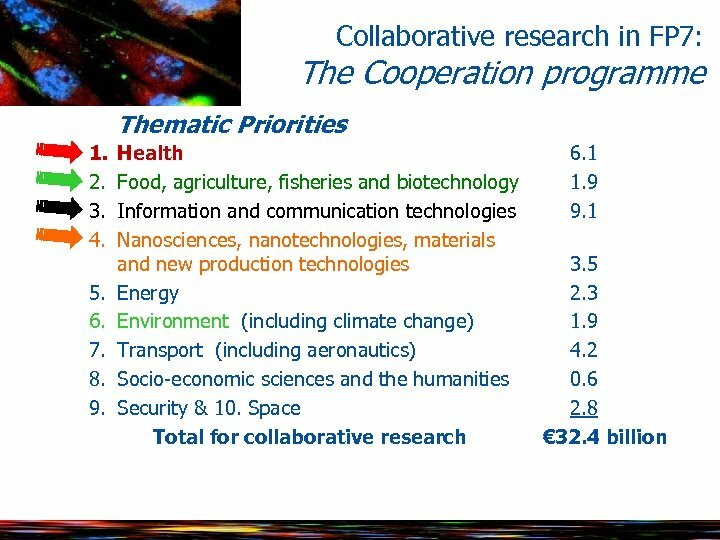 partners Large-scale integrating project (CP-IP)* € 12 m ≥ 3 Network of Excellence (No. 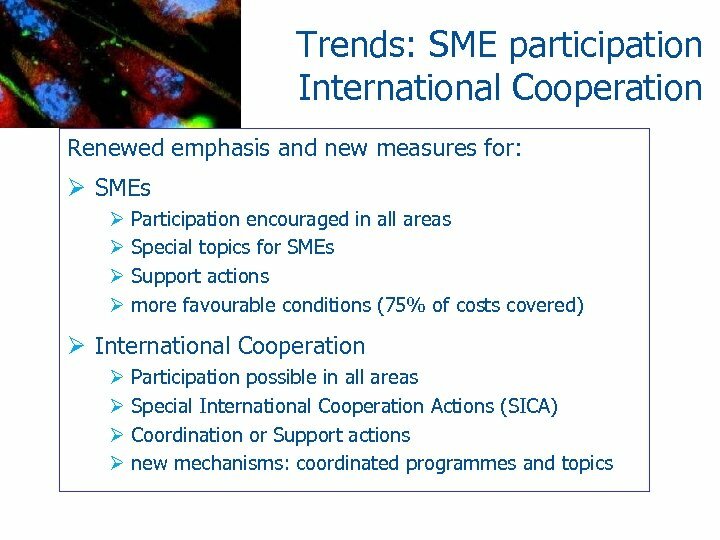 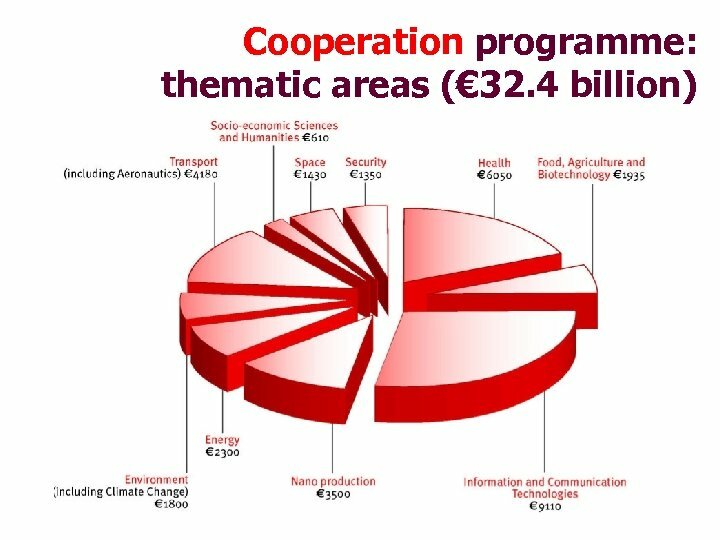 E) € 12 m ≥ 3 € 3 m or € 6 m ≥ 3 Coordination action (CA)** € 1. 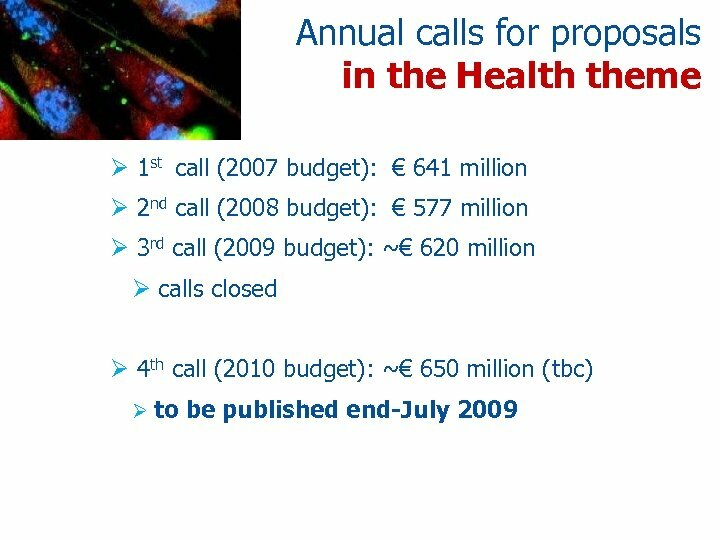 5 m ≥ 3 Support action (SA)** € 0. 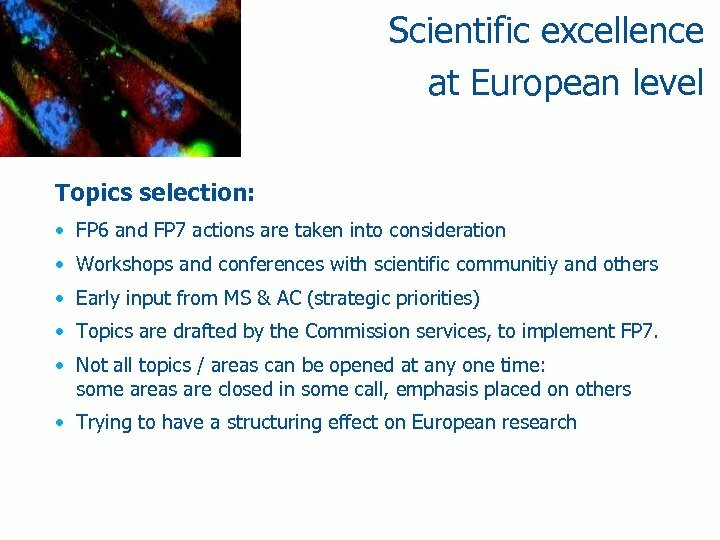 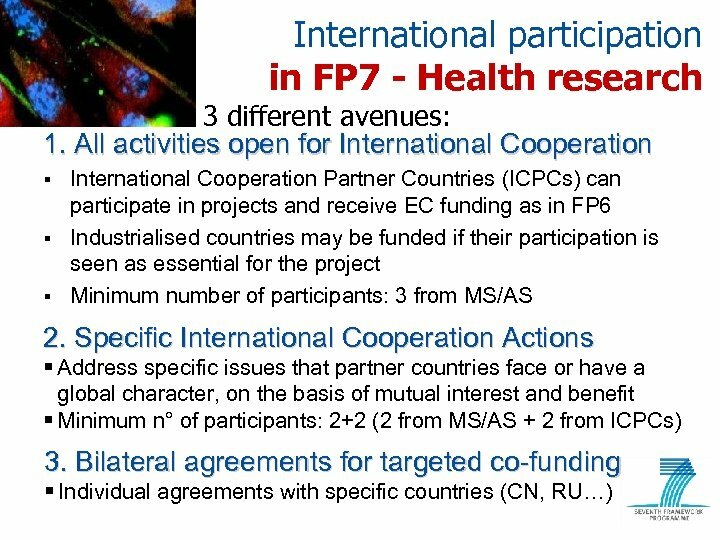 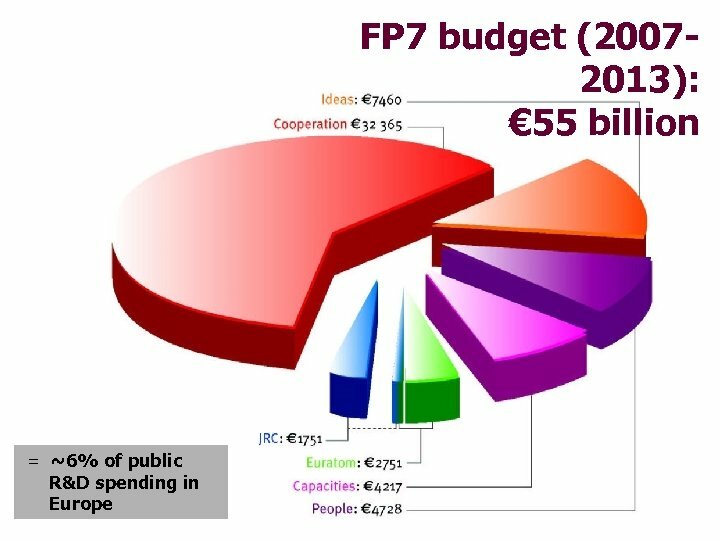 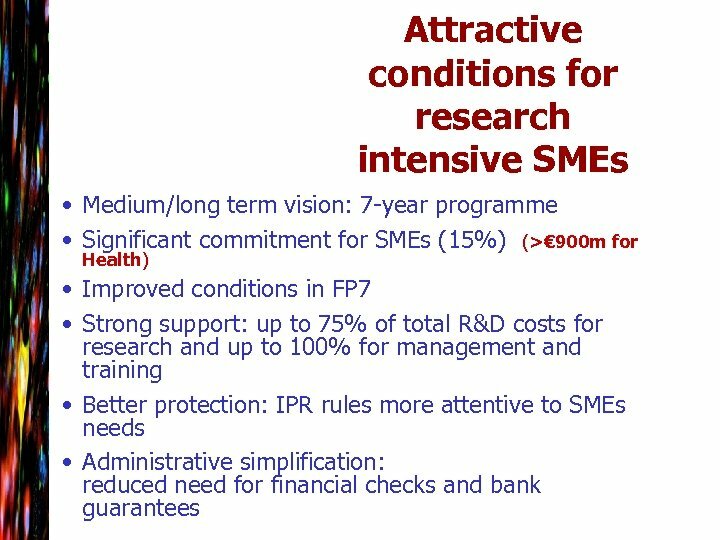 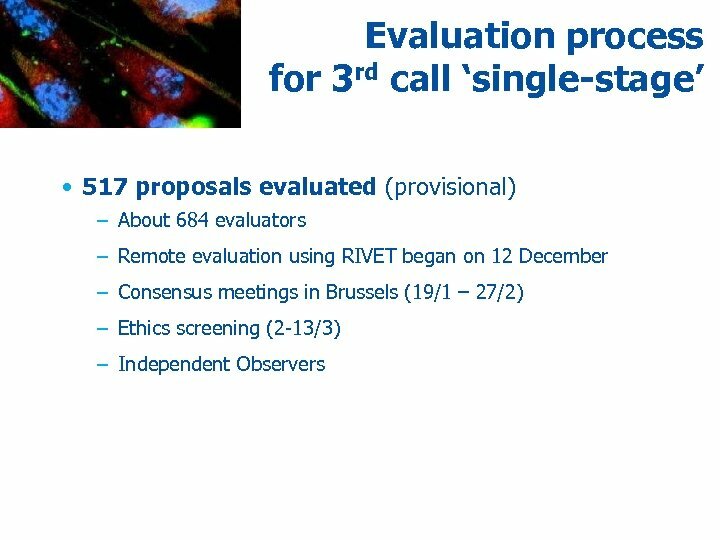 5 m ≥ 1 Small- or medium-scale focussed research project (CP-FP) * for CP-IPs there is also a lower limit to the requested EC grant: € 6 m. ** for CAs and SAs there are some exceptions to the upper limit. 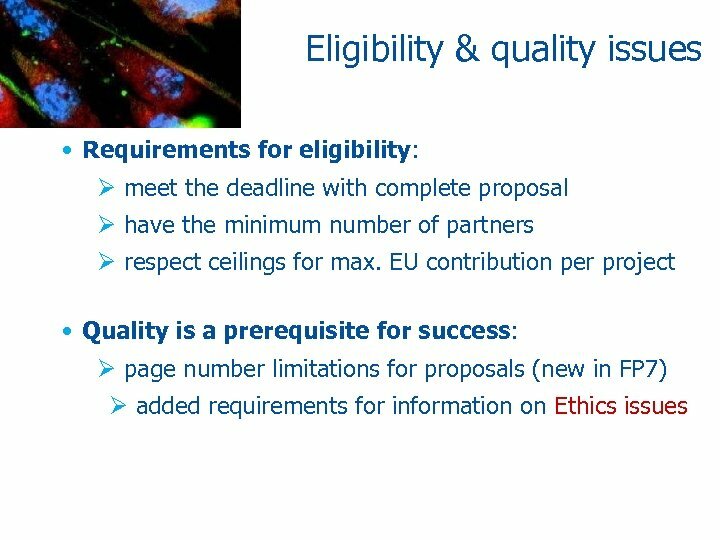 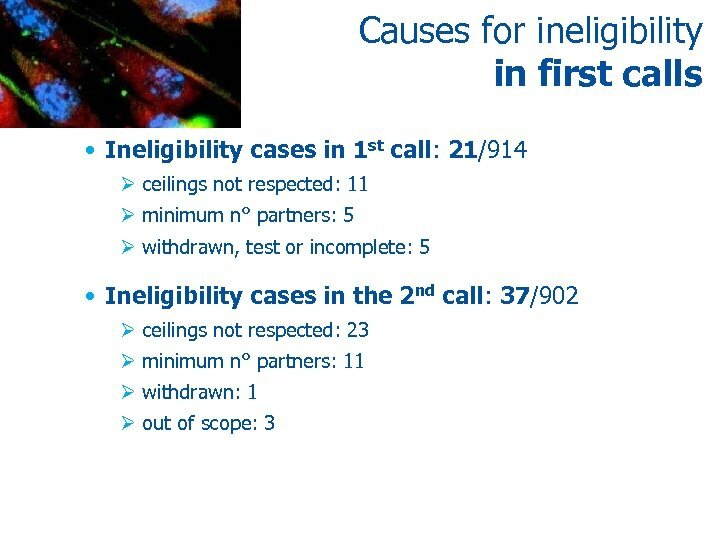 Warning: the limits for minimum and maximum requested EC grant and for the minimum number of partners are eligibility criteria ! 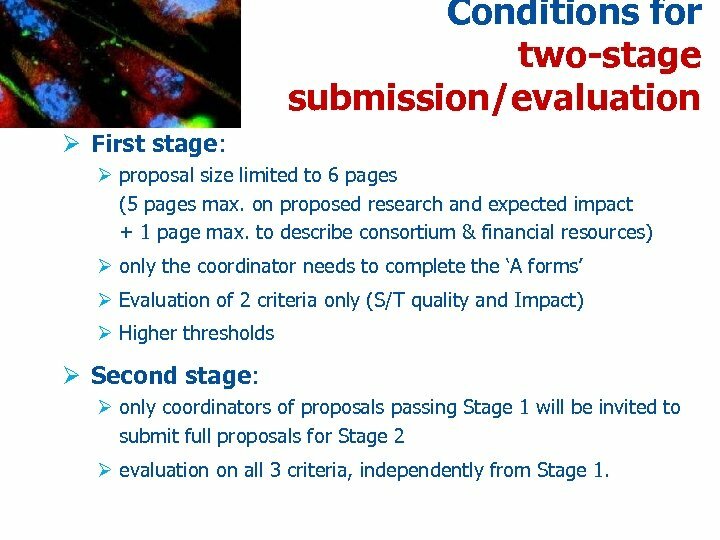 Conditions for two-stage submission/evaluation Ø First stage: Ø proposal size limited to 6 pages (5 pages max. 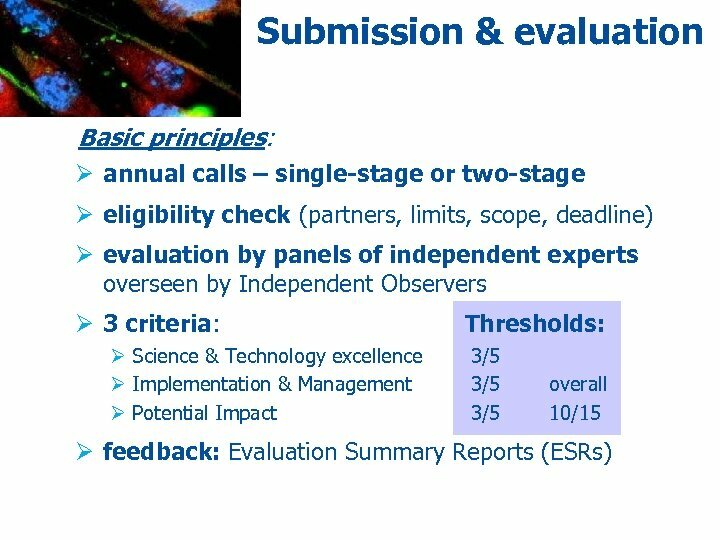 on proposed research and expected impact + 1 page max. 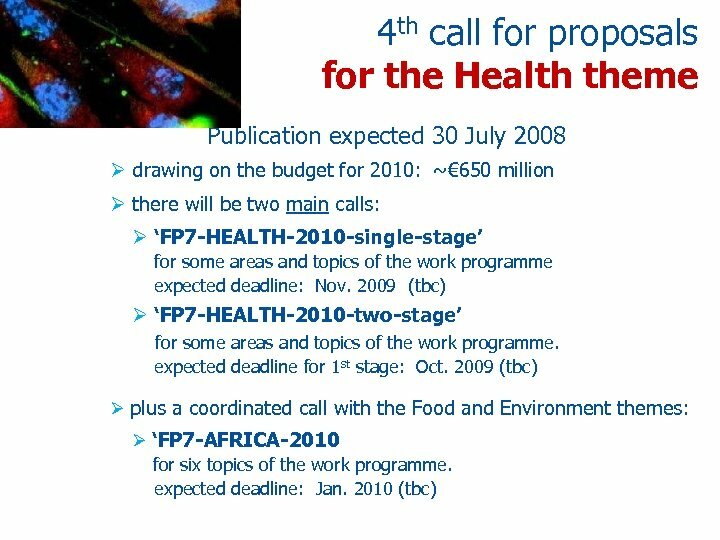 to describe consortium & financial resources) Ø only the coordinator needs to complete the ‘A forms’ Ø Evaluation of 2 criteria only (S/T quality and Impact) Ø Higher thresholds Ø Second stage: Ø only coordinators of proposals passing Stage 1 will be invited to submit full proposals for Stage 2 Ø evaluation on all 3 criteria, independently from Stage 1. 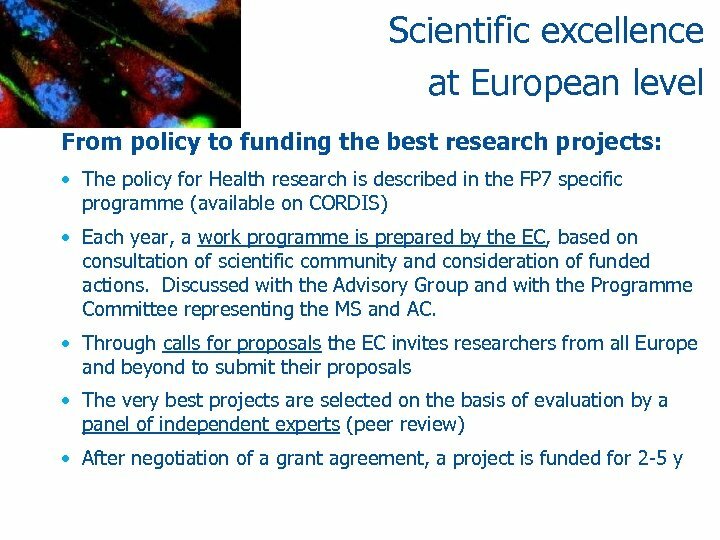 Key factors for success in FP 7 Competition is tough: only the best projects get funded Ø The proposal must be in scope with the topic and the work programme (not wishful thinking) Ø The consortium of partners must be excellent and appropriate for the task (select the right partners) Ø The proposal must address all criteria Ø Convince the evaluators (don’t rely on reputation) Ø and, of course, respect the basic rules. 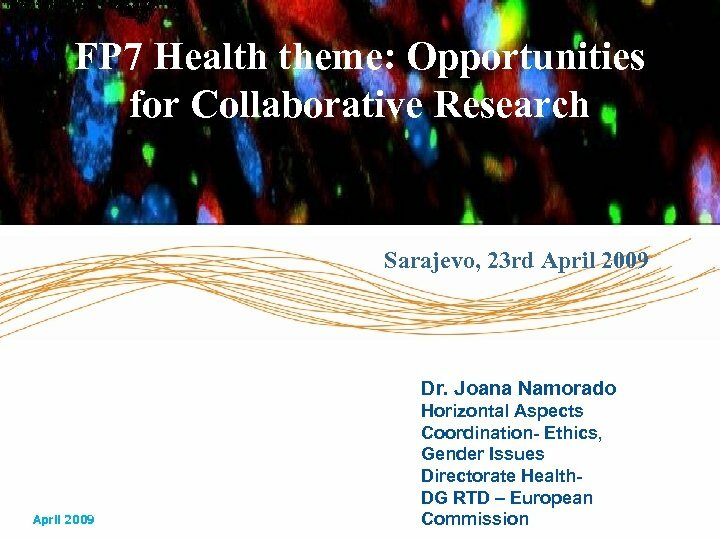 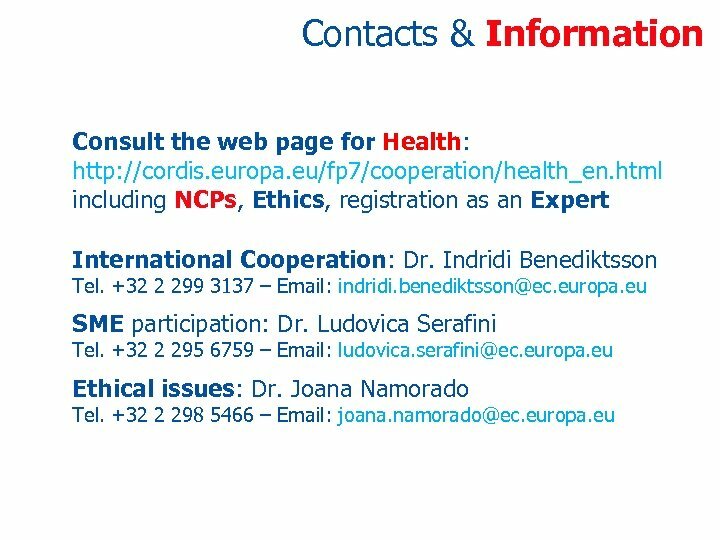 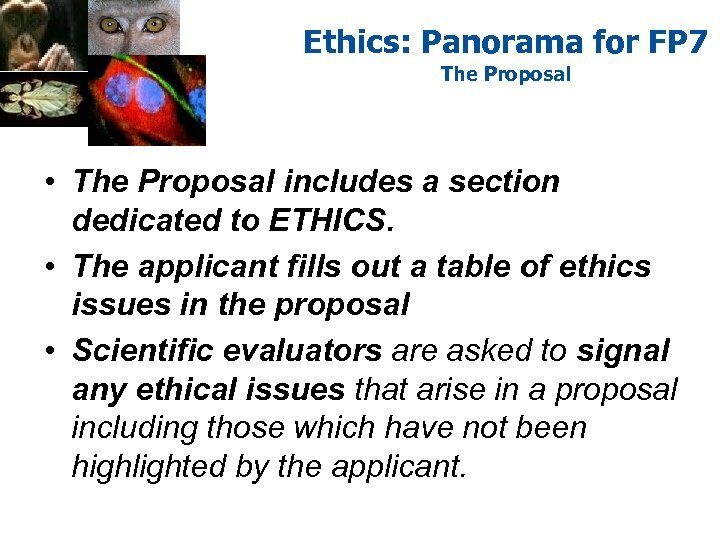 Ethics: Panorama for FP 7 The Proposal • The Proposal includes a section dedicated to ETHICS. 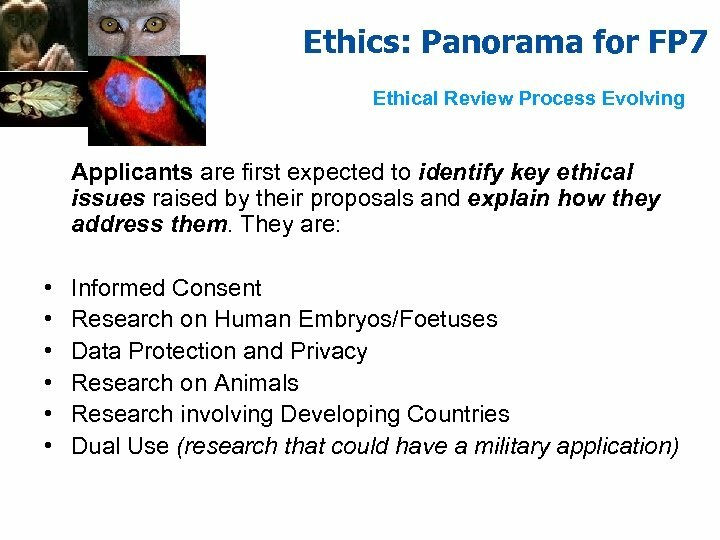 • The applicant fills out a table of ethics issues in the proposal • Scientific evaluators are asked to signal any ethical issues that arise in a proposal including those which have not been highlighted by the applicant.